Dazzling Baby Flower Costume Set - Size 6-12 Mo.
" So precious, so beautifully made! Our baby flower comes complete with, bubble outfit and matching hat. This adorable little flower costume will have your little one looking pretty as a posey, grab your camera, because it's the perfect costume for baby's first halloween photo or trick or treating. Costumes are all about embracing the opportunity to be a fun character from your fantasies, and with every design. 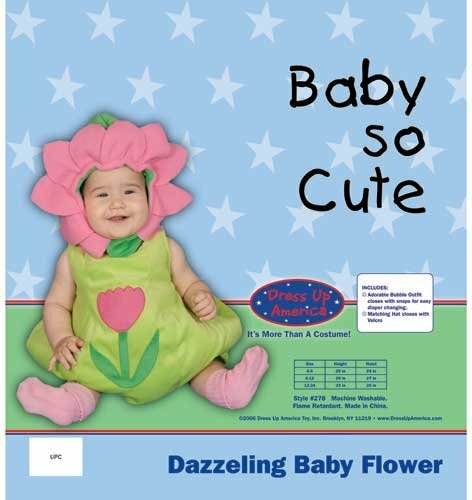 This flower costume is the perfect pick for your little one for play time. Please contact us with any questions. We appreciate your business." If you have any questions about this product by Dress Up America, contact us by completing and submitting the form below. If you are looking for a specif part number, please include it with your message.